This version of the CR1000KD is for OEMs. The OEM can purchase this product without a label or with a company label. This version of the CR1000KD is for OEMs. The OEM can purchase this product without a label or with a company label (see Ordering Info). The CR1000KD is a portable keyboard display for our CR800 and CR1000 dataloggers. 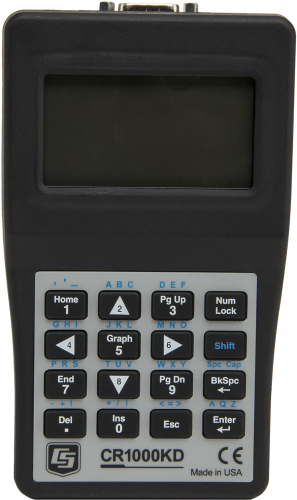 It allows you to check the data logger's status, display or plot sensor readings and stored values, and to enter numeric data or change port/flag state. One CR1000KD may be carried from station to station in a data logger network. The CR1000KD displays 8 lines x 21 characters (64 x 128 pixels) and has a 16-character keyboard. The CR1000KD is powered by the data logger’s power supply. An SC12 connects the CR1000KD to the CR1000WP or CR800; the two connectors on the SC12 allow connection of additional peripherals. 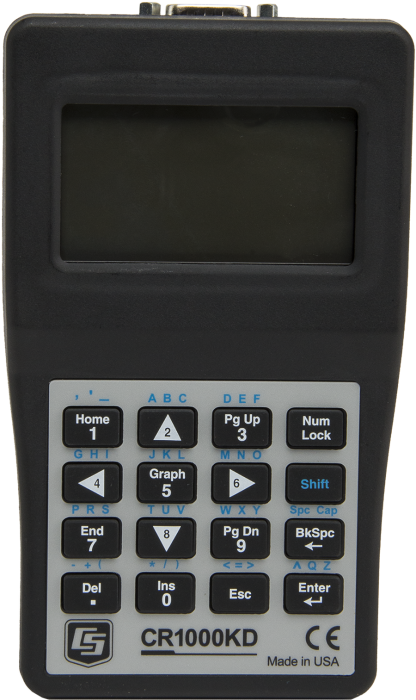 There is not a CR1000KD Operator's Manual; use of the CR1000KD is described in the CR800 and CR1000 datalogger manual. CR3000 The CR3000's integrated keyboard display is preferable for most situations. A special data logger OS is required to use the CR3000; contact Campbell Scientific for more information.